When considering buying a condo downtown, there are plenty of benefits, whether you are an investor or an end user. By living in a bustling city, you’ll be within walking distance to public transit, great food, shopping, and everything else you should need to suit your lifestyle. However, with a great condo, there comes some costs you should consider. You’re probably already familiar with the down-payment, the closing costs and condo fees, but, did you know about Toronto’s development levy? 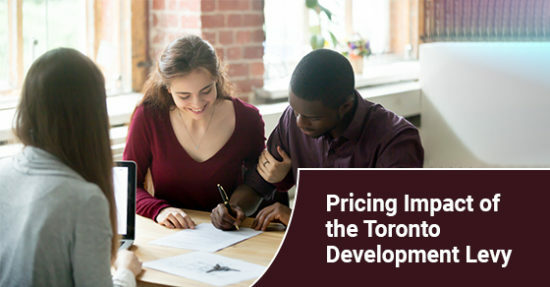 When a developer decides to create a new condo building, home or construction project – basically any kind of dwelling or commercial building – the city of Toronto charges fees to aid in paying for the capital costs of the infrastructure required to provide services to the development. The word “levy” in this case is synonymous with “fee” because it is being charged to the developer who then passes it down to the buyer. In Toronto, development levies are governed under the Development Charges Act of 1997 and can be found in the standard Agreement of Purchase and Sale. The reason development levies are imposed is because the city needs the revenue it collects from the “development levy” to grow the city’s infrastructure. For example, the levies collected from a new condo development going up in the heart of downtown, will be used to create new parks and green spaces, transit expansions and repairs, as well as school and hospital improvements. What do these levies fund? When new people move into an area, the city of Toronto wants to support the current and new residents by ensuring that all infrastructure is supported and the community can continue to expand. One of the major frameworks that is supported through the development charge is education. The Education Act requires that the city of Toronto collect levies on behalf of the Toronto Catholic District School Board. The money collected for the TCDSB goes to improving schools and the education system. When do you pay these charges? Development charges are applied first to the builder, otherwise they will not be able to obtain a building permit. Then, the charges are passed down to you, the buyer. You pay the development levy upon closing (more on that below). How do development levies impact the price of downtown condos? Because the development levy is passed on to the buyer, it will affect the price of your condo. Depending on the square footage of your unit, the location of the building and which developer is heading the project, development charges can cost you anywhere between $8,000-$20,000 (depending on the size of the unit that you are purchasing). The good news is that you only pay this levy once in a single installment when you close your condo. When you are purchasing a pre-construction condo, especially in the downtown core, you need to ensure that the levies are capped. Almost 99% of the time the levies are capped, meaning that there’s a maximum amount that you have to pay on final closing. If the actual levies amount is less than the capped amount you will only have to pay the actual amount. Be wary of developers who do not allow for capped levies for you could end up paying an exorbitant amount at closing. For this reason, you should always work with a broker when buying property, especially in downtown Toronto. Your broker will be able to negotiate with the developer on your behalf, ensure that the paperwork is in order and help you find a new developer if they refuse to cap your levies. It’s important to keep in mind that you have 10 days to walk away from a pre-construction deal after signing the agreement. So, if your broker notices anything off, do not pursue this condo unit. If you are interested in purchasing a pre-construction condo in the heart of downtown, it’s crucial that you understand how much you could be paying in levies. Please contact us for more information regarding the city of Toronto’s development charges. We can help you navigate the costs and fine print so that you not only get a beautiful new property, you get it at a price that makes sense.